Anyway – let me present you my next finished miniatures. Three Terror tots and Cherub from Lilith’s Box form Neverborn Crew of Malifaux game. I’m totally amazed by all Wyrd products. The variety of models for all the factions is stunning. At first when I looked at the offer of models – I got little bit confused. I like a lot some few single models from different factions and I couldn’t decide which one to choose for the start (and it was pretty obvious that it won’t end on one faction – there are way to many cool miniatures to grab here…). After some short thinking – I chose Neverborn – the bunch of monsters – natural habitants of the world on the other side of the breech. Hostile and mean fellows. Like this attitude a lot:). My first box- Lilith – Mother of Monsters. 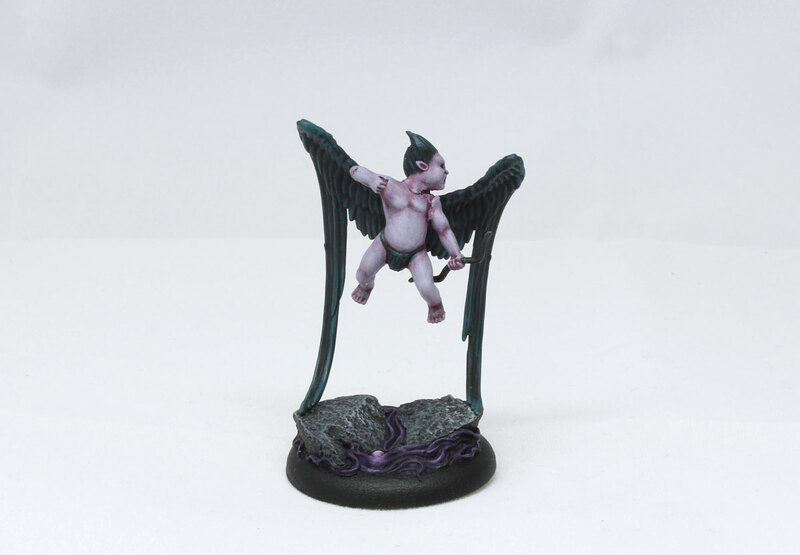 I already have painted Lilith, and there was the time for next models form the set – Cherub and Terror Tots. Cherub is so similar to Cupid. Body of small child, angelic wings and the bow – everything is the same here. Expect Cherub, Lilith’s Totem is mean angry SOB. Quite opposite to Cupid. Terror Tots – Neverborn minions are actually young (very early stage) of much more dangerous Nephilims. Terror Tots are small and in Neverborn social ladder are at very bottom. Despised and bullied all the time – only very few have the actual chance to grow to state of Nephilim. Oh, well – they might be small and weak but they are annoying for sure. With their ability of Sprint – they are very effective in capturing objectives (well, that’s theory – I will see about that soon in practice:). What can I say? I love those little buggers. So tiny, with child-like posture. So unobtrusive. But when you look closely – you will notice small blades and claws and little sharp teeth. Crazy awesome! Probably one of the best minis in my collection and for sure my favourites from Malifaux ( they were the reason why I chose Lilith box set for start). Colours. That’s was pretty simple and easy painting job. There were not too many details on these models, that needed my attention. The base colour was Slaanesh Grey with coat of Carroburg Crimson Shade. When shade has dried I drybushed all miniature a bit and I added few layer of watered Slannesh Grey ( afterwords – some lights Slaanesh Grey mixed with White Scar). Hair and Cherub’s wings – Incubi Darkness. All four minis were finish in about 3-4hours. I put them on resin Possesed Bases from Micro Art Studio. I find them perfect for Neverborn – their daemonic aura is glowing even more:). 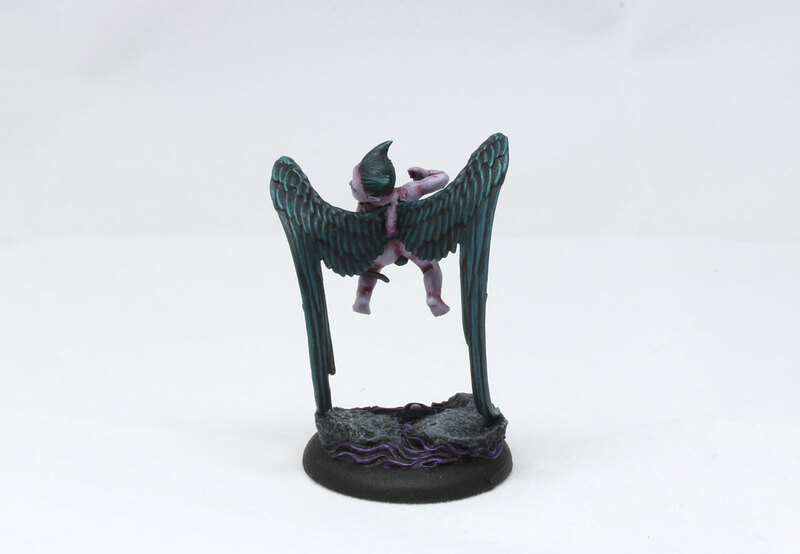 Next in line – Barbaros, the last model from Lilith box set. Dude! Nice work – those guys are seriously creepy! I might need to get me some for Rogue Trader! You paint with such a smooth style, I’m so impressed. How did they go together? It looks like the Cherub has some filling around the left arm, and one of the tots looks the same round its neck. The bases are also really fitting. Lovely work on these little midgets! Your paint on them is just perfect! Exceptional work on these devilish little angels. Everything is top notch – the technique, the choice of contrasting colours, the aptly subdued bases – but the skin is perfect. And not just that, looking so smooth and wicked at the same time, it captures the spirit of the models as well!